A simple web server that shows and control the value of the LED Digital using an Arduino Wiznet Ethernet shield. This sketch for GR-KURUMI is merged Web-server and LED Blink. 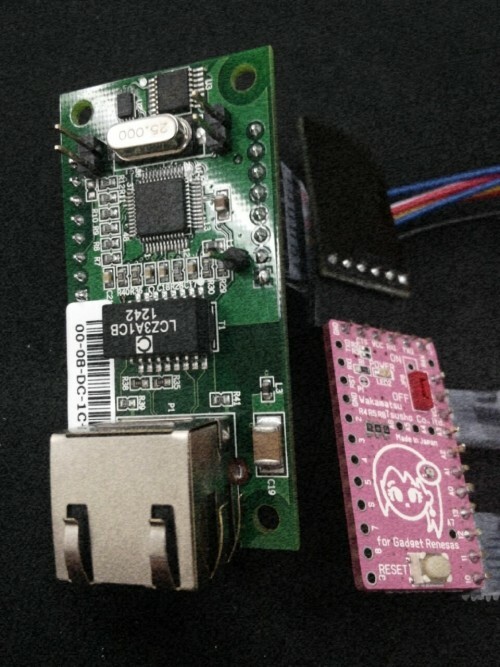 You can do controlling and monitoring the RGB LED on GR KURUMI Board via Internet or Local Network. After opening a web-browser and navigating to the Ethernet shield’s IP address, the GR-KURUMI will respond with just enough HTML for a browser to display the data. A RGB LED on GR-KURUMI is also controlled by the request of web-browser. Pin 22,23,24 has an LED connected on most Arduino boards. So, 5th~7th data are parsed to control RGB LEDs. Check current LED status as digitalRead() and Send http respoonse inclued the LED status. This entry was posted in GR-KURUMI, OSH and tagged Ethernet, GR-KURUMI, W5500, WIZ550io. Bookmark the permalink.